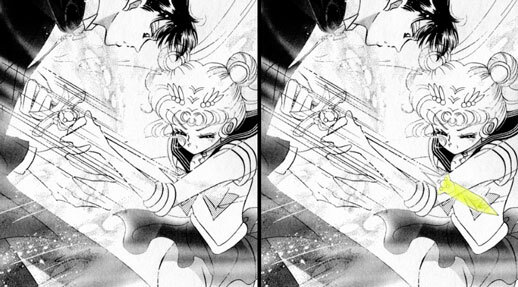 [Debate] Did Usagi Successfully Kill Herself in the Manga? Did Usagi actually stab herself and die? Did things actually happen as they were stated in the manga here? 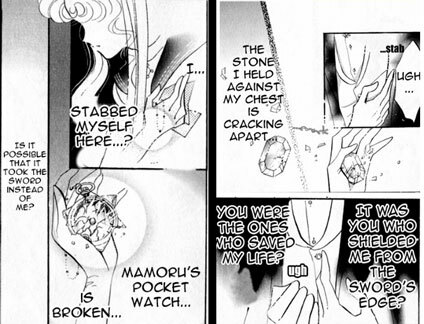 Did Mamoru's pocket watch and the Shittenou Stones actually appear and protect Mamoru and Usagi respectively from ever being stabbed and actually dying? Did they both simply pass out at the moment that Usagi used the sword to try to stab them? Did the Inners sacrificing their lives then simply wake-up an unconscious Usagi from inside Metalia? Did Usagi successfully kill Mamoru and herself? 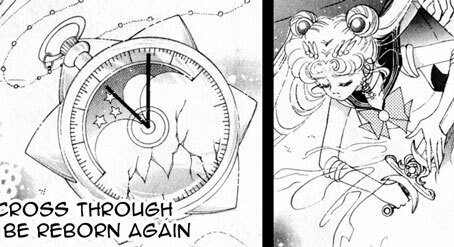 Then either the Inners sacrfice, the power of the Silver crystal, or some combination of the two subtly changed history so that Usagi/Mamoru didn't die instead adding the absurd coincidences of the fainting + watch/stones magically appearing and protecting them. I always thought that she didn't-or at least it wasn't fatal. If those squiggles were indeed blood, then the crystal managed to heal their injuries and the killing blow was blocked by both the stones and the watch. Title : TITAN SOLDIER OF STARS AND DESTINY! SAILOR CRONUS! It wouldn't be the first-- or last-- time that what Naoko drew was inconsistent with what was intended to happen in a given scene. Sometimes physics fail in deference to art. I believe the image of her stabbing herself (where it looks like the sword really went through) was a fake-out. Consider that she did the same thing with Haruka in her introduction: she was constantly drawn with masculine features to make you *think* she was male, until it is finally revealed that she is female. If she was always drawn recognizably as female, the readers would already know the secret long before it's revealed, and that would have reduced its impact. So in this case, I believe the images were fake-outs, made to make the reader believe they had died until it is revealed that they weren't; otherwise it would have reduced the impact of the scene. As for the blood, it is very plausible that she did injure herself but then healed through the power of the Silver Crystal, since that seems to be the nature of the Silver Crystal anyway. I am the Titan Soldier of Stars and Destiny! Protector of the innocent! Defender against evil! And invincible! SAILOR CRONUS! Enemies beware-- for your fate is sealed! I always assumed the pocket watch, the stones, and love saved them. But, oh, the drama if they actually died! ...I seized the strings of destiny and pulled. Instead of a hit, a miss; instead of a pierced heart, a cracked watch, a quartet of broken stones. 1. Sometimes the items that the Sailor Senshi obtains are sentient. The Moon Kaleidoscope spoke to her. Sailor V's pen spoke also. So it's possible the Silver Crystal really DID have some sway over the events. 2. The stones were the four generals and perhaps they, too, persuaded fate to protect Endymion as Serenity was protected by her Silver Crystal.